Being a place that is strongly associated with Sai Baba, who spent most of his life in the town, preaching and spreading his message of brotherhood and peace, it is only obvious that the place is frequented by hundreds and thousands of visitors of all faith every year. Tranquil, rustic, and still unspoiled by modernity that is getting more materialistic day after day, Shirdi is indeed an ideal place to take a relaxing respite away from the chore of the daily life. Being here means an opportunity to spiritually heal the mind as well as the body, and discover yourself. Hire a taxi from Mumbai or Nashik to get into the place. There are plenty of taxis and buses. The road connectivity, itself, is good except in a few stretches. As soon as you arrive here, you get the vibe of spirituality that prevails throughout the area. It is quite a slow-paced town as compared to the large neighboring cities, with a couple of small trades backing up the place’s revenue. It is advisable to pick a hotel that is in your budget and close to the Samadhi Mandir. The Samadhi Mandir is the centre of a pilgrimage to the town and the most popular amongst the places to visit in Shirdi. It is here, where the mortal remains of the saint are kept as he departed in 1918. Since then the temple has attracted thousands of pilgrims from around the globe. A good to know fact, it is said that the temple was built by a rich man from Nagpur, and was originally supposed to house an idol of Lord Krishna. Visiting the Samadhi Temple is usually the first thing that the backpackers do. The ambiance in and around the temple is very pious, with the priests doing the rituals in the sanctum, horde of devotees eagerly waiting, and in the midst of all, a beautiful life-size statue of the saint sits. After one is done with visiting the Samadhi temple, it is a general trend to visit Gurusthan next. It is the place, where it is believed that Sai Baba was spotted for the first time meditating by the locals. There is an old tree under which the saint sat and meditated. A huge portrait of his is placed here and in front of it is an incense that keeps on burning day and night. The town is quite small in area and there is not much to do and neither too many places to visit. The other important place of interest that are worth visiting are: Dwarkamai Masjid, Lendi Bagh, Chavadi, and Dixit Wada Museum. The best time to go for a Shirdi tour is after post monsoon season till March. 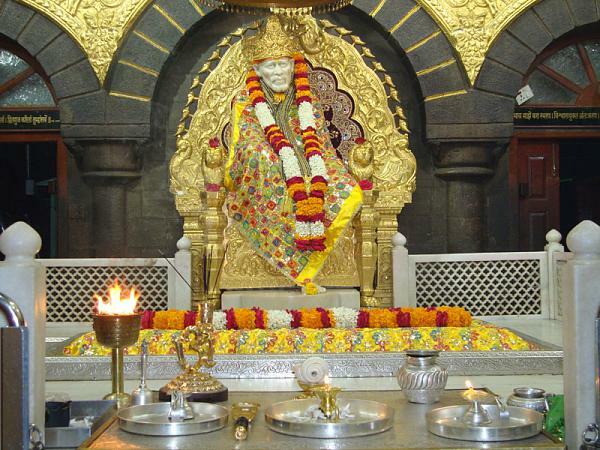 Shirdi has no airport and the nearest railway stations are in Shirdi Sai Nagar, Manmad, Nasik, Pune, etc. Daund is also a popular gateway to Shirdi. It comes under Pune district and is well connected to Shirdi by road. It takes about 4 hours for a Daund to Shirdi taxi to cover the distance.